What was the Largest Hurricane to Hit the United States? 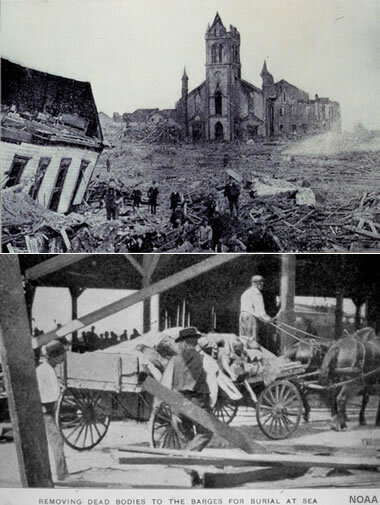 Damage from the Galveston Hurricane of 1900 was caused by the hurricane and resulting storm surge. This was the greatest natural disaster in terms of loss of life in U.S. history. So many people were killed that horse carts were used to transport bodies through the streets of Galveston. The bodies were placed on barges and buried at sea. Others were burned in huge funeral pyres. Photos and captions from NOAA. Wind speed, cost, deaths, intensity, and width are some of the ways to define the largest hurricane. If using wind speed, intensity, or width as the definition, it is necessary to explain whether the measurement was recorded at landfall or was the highest measurement recorded in the hurricane's life cycle. How do Hurricane Harvey and Hurricane Irma compare to the "largest hurricanes" that have hit the United States? At this time, only preliminary estimates of the financial impact and fatalities are available. Wind Speed: Both Hurricane Harvey and Hurricane Irma were both category 4 hurricanes and had sustained winds of 130 mph when they made landfall in the United States. Hurricane Harvey’s wind speed was recorded near Rockport, Texas. Hurricane Irma’s wind speed was recorded on Cudjoe Key. This places them both well outside of the “top 5 hurricanes” for wind speed at landfall. Financial Impact: As mentioned above, these costs are estimates and it could be months before the final numbers are available. On September 3, 2017, Reuters reported that Texas Governor Greg Abbott reported damage estimates from Hurricane Harvey between $150 billion and $180 billion dollars. The high end of these estimates would place Harvey as the costliest hurricane in U.S. history. CNN Money reported an estimated cost between $64 billion and $92 billion from the damage done by Hurricane Irma. These estimates easily place Irma in the top 5 for costliest hurricanes in America. It could end up being #3 on the list when the final numbers are reported. Fatalities: Thankfully, neither of these two hurricanes rank high in this category. The Washington Post reported on September 14, 2017 that Texas officials are attributing at least 82 deaths from Hurricane Harvey. Early numbers for Hurricane Irma have the death total at 42. However, this number is going to rise as investigations continue. The largest loss of life from a hurricane is often caused by storm surge and flooding rather than the winds. Do not underestimate a lower category hurricane! None of the top five deadliest hurricanes in United States history were a Category 5 hurricane at landfall. The Great Galveston Hurricane of 1900 was the deadliest hurricane to ever hit the United States and caused between 8000 and 12000 deaths. The storm reached the Texas coast south of Galveston on September 8 as a Category 4 hurricane with a storm surge of 8 to 15 feet. The lack of warning and the high storm surge caused this storm to have the highest death toll of any United States hurricane. The 1928 Okeechobee Hurricane which claimed 2500-3000 lives was the second-deadliest hurricane in United States history. Most of the deaths from this hurricane were caused by a lake surge of 6 to 9 feet that inundated areas surrounding Lake Okeechobee. Hurricane Katrina of 2005, the third-deadliest hurricane in United States history, killed at least 1500 people. Katrina made landfall in the United States at three different locations. Katrina's first landfall was near the Miami-Dade / Broward county line in Florida, dropping 10 to 14 inches of rain, just after reaching hurricane status. After crossing Florida it strengthened in the Gulf of Mexico and made landfall near Buras, Louisiana and then made landfall again near the Louisiana / Mississippi border as a Category 3 hurricane. Katrina's highest storm surge of 25 to 28 feet occurred along the Mississippi coast. Also, this storm dropped 8 to 12 inches of rain inland from the northern Gulf coast and spawned thirty-three tornadoes. 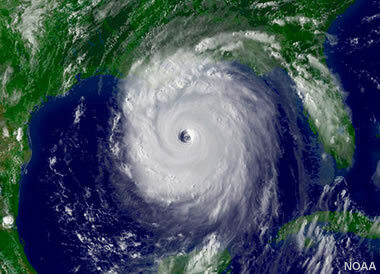 Satellite image of Hurricane Katrina showing its massive width while in the Gulf of Mexico before hitting New Orleans, Louisiana and Mississippi. Image by NOAA. It is a common misconception that a lower category hurricane is less of a threat than a higher category hurricane. For example, Hurricane Katrina was the costliest hurricane in United States history, and it was only a Category 3 hurricane when it made landfall. Hurricane Andrew was the only Category 5 hurricane to make the list of the top five costliest hurricanes to strike the United States. Hurricane Katrina in 2005 was easily the costliest hurricane in United States history with property damages over $108 billion (in 2013 dollars). Storm surge along the Mississippi coast completely destroyed many structures, with damage extending several miles inland. Katrina's storm surge topped and breached levees in the New Orleans metropolitan area, resulting in the inundation of much of the city and its eastern suburbs. Wind damage from Katrina extended well inland into northern Mississippi and Alabama as well as in Miami-Dade and Broward counties of Florida. Hurricane Sandy, also known as "Superstorm Sandy," caused $71.4 billion in damage (in 2013 dollars) and killed 286 people in 2012. Much of that damage was caused when the storm hit the highly populated areas of New York and New Jersey. The storm surge that hit New York City flooded streets, subways, tunnels, and damaged utility service. Damage was caused in the United States, Bermuda, and the Caribbean islands. Hurricane Ike was the third-costliest hurricane in United States history. It struck the Gulf Coast of the United States after causing significant damage in Cuba, Haiti, the Bahamas, and Turks and Caicos. United States damage was estimated at $29.5 billion, and the storm killed at least 195 people along its path. Meteorologists use sustained wind speed to determine what category a hurricane is. To the left is a table showing what wind speeds define the different storm categories. The wind speed must last for over one minute to be considered a sustained wind, while a gust is the highest wind speed for a three-second period within the one-minute sustained reading. Most of the highest wind speeds at landfall are estimated because of damage to (or lack of) wind-recording instruments. 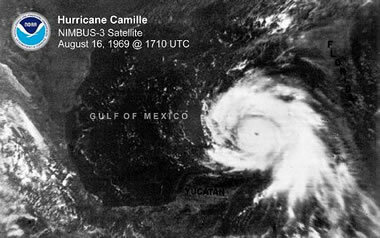 Hurricane Camille of 1969 had the highest wind speed at landfall at an estimated 190 miles per hour when it struck the Mississippi coast. This wind speed at landfall is the highest ever recorded worldwide. Actual maximum sustained winds will never be known because the hurricane destroyed all the wind-recording instruments in the landfall area. Columbia, Mississippi, located 75 miles inland, reported 120 mph sustained winds. Hurricane Harvey Advisory Number 23: National Hurricane Center, August 25, 2017, bulletin on the nhc.noaa.gov website. Irma Downgraded to a Tropical Depression: The Weather Channel, September 11, 2017, article on Weather.com. Funding battle looms as Texas sees Harvey damage at up to $180 billion: Marianna Parraga, Gary McWilliams; Reuters, September 3, 2017, website article on Reuters.com. Irma and Harvey together will be as expensive as Hurricane Katrina: Julia Horowitz; CNN Money, September 11, 2017, article on the Money.CNN.com website. Texas officials: Hurricane Harvey death toll at 82, 'mass casualties have absolutely not happened': Eva Ruth Moravec; The Washington Post, September 14, 2017, article on WashingtonPost.com. Some were poisoned. Others drowned. How 42 people in Florida died from Hurricane Irma: Mary Ellen Klas; Miami Herald, September 19, 2017, article on the MiamiHerald.com website. The Deadliest, Costliest, and Most Intense United States Tropical Cyclones From 1851 to 2010 (and Other Frequently Requested Hurricane Facts): Eric S. Blake, Christopher W. Landsea, and Ethan J. Gibney; NOAA, August 2011, PDF document on the nhc.noaa.gov website, pages 7 - 9. Hurricane Andrew holds the title of the hurricane with the second-highest recorded wind speeds at landfall, with winds estimated at 167 miles per hour as it crossed south Florida. Many of the instruments for measuring wind speeds were destroyed by the hurricane, which leaves the actual sustained wind speeds unknown. The 1935 Labor Day Hurricane had estimated winds of 161 miles per hour, the third-highest wind speed at landfall of any hurricane to strike the United States. The wind speed is estimated, using hurricanes with similar pressure readings at landfall, because of the lack of wind instruments at the time.